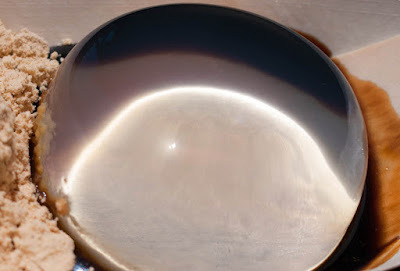 A Raindrop Cake is a clear gel dome so delicate that it turns to water in your mouth—and becomes a puddle on your plate if you don’t eat it within 30 minutes (because of total gel reversibility). The most remarkable property of `physical gels' is their reversibility. They melt just by heating but gel again upon cooling. These transformations can be repeated indefinitely in the absence of aggressive substances that could hydrolyse the agarose molecules or destroy them by oxidation. In Japan, it is called mizu shingen mochi, which means “water cake”, and is made with mineral water from mountain springs. Raindrop cakes are usually served on bamboo plates with a drizzle of black sugar syrup and a dusting of roasted soybean powder, but go ahead and use your favorite flavorings. To create the round shape, you need a mold. Try a round-bottomed drinking or wine glass, a small rounded bowl, or a giant ice-ball mold. This recipe is enough for two palm-sized spheres. 1) In a small, microwavable cup, combine the water and sugar and heat the mixture in the microwave oven on high for 30 seconds. 3) Pour the liquid into your mold. Gently pop any bubbles with a spoon. Chill it in the refrigerator for several hours or overnight. It should be solid to the touch, but still wobbly. 4) To serve, gently tip the raindrop cake onto a plate so the rounded side is facing up. Serve with one of the toppings in the Suggested Raindrop Cake Toppings list, or create your own! 5) Variation: To add a piece of fruit inside the raindrop cake, fill the mold halfway and put it in the refrigerator to set for about five minutes. Then place the fruit on top, and cover it with the rest of the liquid agar mixture. Let it chill until solid. What is Meant by Agar Agar Powder? Agar is defined as a strong gelling hydrocolloid from marine algae. Agar is called Kanten in Japanese, which means `frozen sky' referring to the way it was first manufactured by artisans based on freezing and thawing of the extracted agar gel in the open fields. In addition, we can add that agar is also a mixture of polysaccharides made of dextro and levo galactoses united linearly. Agar-agar, also called simply agar, was the first phycocolloid used as a food additive in our civilization having been employed in the Far East over 300 years ago. Phycocolloids are those gelling products extracted from marine algae that are utilized in several ways solely because of their colloidal properties. 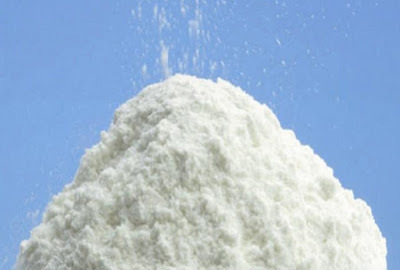 The most important ones are agar, alginates and carrageenans that are produced in industrial quantities and presented in the form of clear colored powders. Agar main structure is chemically characterized by repetitive units of D-galactose and 3- 6, anhydro-L-galactose, with few variations, and a low content of sulfate esters. The extraordinary gelling power of agar is based exclusively in the hydrogen bonds formed among its linear galactan chains that provide an excellent reversibility, with gelling and melting temperatures that differ normally by about 45 degree Celsius. Being `physical gels' they provide agar with interesting and unique properties in many of its applications especially in the preparation of microbiological culture media (bacteria, yeast and moulds) in which such properties become fundamental. Agar is derived from the technique recorded by Tarazaemon Minoya in 1658 that has its fundamentals in the insolubility of agar when cooled. The traditional technique adapted by Minoya, developed towards the middle of the seventeenth century, is still in use marginally to produce `natural agar' in the oriental craft industry in the forms of strip agar (Ito-Kanten) or square agar (Kaku-Kanten). This technique started with careful washings of Gelidium amansii employing similar devices to those used to wash tea-leaves. Related Post: What are the Types of Agar Products? In the Orient `natural agars' in the old forms of strips and squares are still being used at home to prepare traditional dishes. Lately such types of agar have reached our dietetic and natural food stores while in Japan they are being substituted by powdered industrial agars prepared as tablets. Where to Buy Agar Agar at the Cheapest Price with Good Quality? Major supermarkets have it; it’s in the seaweed or exotic foods section. If you live in rural area, you can get it online easily enough. There's a pretty good selection of agar agar powder from Amazon.com. Just click here, NOW Agar Powder, 2-Ounce. Getting online just makes it easier to get what you want since they have a lot more selection of agar agar than in stores most of the time. Is Agar Agar Powder Healthy? Agar agar is a good source of calcium and iron, and is very high in fiber. It contains no sugar, no fat and no carbohydrates. It is known for its ability to aid in digestion and weight loss. Is Agar and Gelatin the Same? Both Agar and Gelatin are essential ingredients in the preparation of desserts worldwide. The main difference between agar and gelatin is the source from which they are derived. Agar is a vegetarian substitute for Gelatin since it is derived from a plant and has higher gelling properties. Agar Agar is a combination of sea-derived flakes that gels when combined with liquids, making it perfect for vegetarians and those concerned with eating halal since it's an all-natural substitute for pork-derived gelatin and any other non-halal, non-dhabiha meat source of gelatin (which can also come from beef). What Can I Use Instead of Agar Agar? Substitute powdered agar-agar for gelatin using equal amounts. 1 Tbsp. of agar-agar flakes is equal to 1 tsp. of agar-agar powder. Set 2 cups of liquid using 2 tsp. of agar-agar powder, 2 Tbsp. of agar-agar flakes, or one bar. Watch Videos: "raindrop cake youtube"
2) Mandarin Orange Raindrop Cake- "raindrop cake recipe"